I know many of you are Teefury fans - well here's a great one for Who fans too! 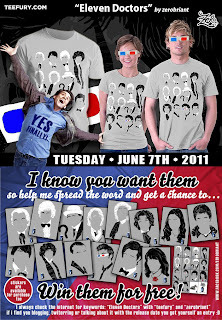 This t-shirt will be their shirt of the day on Tuesday, June 7! Thought you all might like it. :) Plus, if you help get the word out, you can be entered to win a free shirt! Always a plus. Haha! Zerobriant is the designer, so go check out all their awesome designs. And I'm sure I'll be wearing this in an upcoming video!